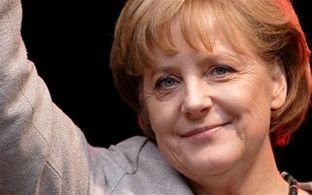 Germanyâ€™s first female chancellor Angela Merkel has been held up as a strong and capable leader by Alison Smale, Executive Editor, International Herald Tribune. Smale was a speaker at the marcus evans Women Leadership Conference, in Prague, on 11- 12 November. â€œI think she is a very strong female leader. She has proven remarkably able to navigate the extremely difficult fields of German politics and itâ€™s a very male-dominated field,â€� Smale explains. However, Merkel is very much in the minority when it comes to occupying a leadership position in politics. Asked whether female leaders can be rejected because people feel they donâ€™t have the necessary qualities for effective leadership, for example Hillary Clintonâ€™s failed Presidential bid, Smale disagrees. â€œThe mechanics of why actually Hillary Clintonâ€™s bid for the presidency failed - the reasons basically lie very much in the weeds of the way the political campaigns are conducted. I donâ€™t think they have that much to do with the fact that she was a woman. That being said â€“ yes of course leadership ranks are still very male. I think it sometimes is helpful to remember how relatively recent the push for gender equality and for womenâ€™s empowerment really is. One of the most debated questions, according to Smale, is whether women possess unique capabilities that are a distinct advantage in business or is leadership the same regardless of gender. â€œI do think that overall women tend to approach decision making and therefore leadership in a slightly different way. The problem with talking about this is that for every example you can bring you can bring a counter example. It again goes back to this point about diversity. You want your decisions to be of the very best quality. And they usually are when you have ensured that as many points of view as are relevant and you can muster are brought to bear on the conduct of whatever business it is you are engaged in. I think even female leadership may turn out to be slightly different and emphasises slightly different things,â€� she adds. The marcus evans Women Leadership Conference took place in Prague on 11-12 November. Compliance with anti-corruption regulations is critical for business growth.